Huffington Post 13/11/2013: While the United States and many European countries scramble to secure borders and crack down on undocumented immigrants, one little island has come up with a solution fit for late night TV. 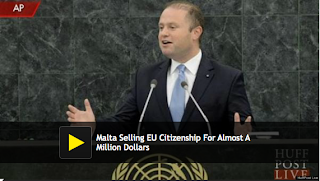 In a move approved by parliament Tuesday, Malta will begin selling citizenship to qualified applicants for the low, low price of just 650,000 euros (roughly $873,730), according to The Telegraph. And what's more: That purchase comes with the full perks of European Union citizenship, including Schengen borderless travel and a United States visa waiver. Sound too good to be true? Maltese Prime Minister Joseph Muscat estimates the new program will rake in roughly 30 million euros in its first year (equivalent to about 46 applicants), followed by 200 to 300 applicants in subsequent years. The aim, he says, is to attract new, "high value" citizens to the island, by which the prime minister apparently means those who can raise close to...read on.